Artist's impression of a "Hot Jupiter" with a rocky companion. Image Credit - NASA/ESA (G. Bacon). Using a revolutionary new camera, UK astronomers have a real chance of being the first to find Earth-like planets around other stars. PhD student Neale Gibson of Queen's University Belfast will present the first results from the RISE instrument in his talk on Wednesday 2 April at the RAS National Astronomy Meeting in Belfast. RISE is a new fast camera designed by astronomers at Queen's University, Belfast (QUB) in collaboration with Liverpool John Moores University and is now installed on the 2m Liverpool Telescope on the Canary Island of La Palma. Since the early 1990s, astronomers have found more than 200 planets in orbit around stars other than our Sun (so-called 'extrasolar' planets). These have been detected through two techniques that are particularly sensitive to massive planets in orbit close to their parent star. 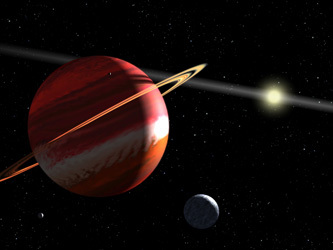 Firstly, planets can be found through their gravitational pull on the star they orbit - as the extrasolar planet moves the star wobbles back and forth. By measuring this movement astronomers can deduce the presence of a planet. Secondly, the transit search technique looks for the dip in brightness of a star as a planet passes in front of it. However, neither of these techniques are currently good enough to find small extrasolar planets similar to the Earth. So far most of those found are so-called 'hot Jupiters' - large gas giant planets very close to their parent star. The RISE camera is primarily designed to find Earth-mass planets in orbit around stars already known to host hot Jupiters. With RISE, scientists will search for extrasolar planets using a technique called transit timing, which may provide a short cut to discovering Earth-like planets with existing technology. Transit timing works on the principle that an isolated hot Jupiter planet orbiting its host will have a constant orbital period (i.e. its 'year' remains the same) and therefore it will block out the light from its parent star in a regular and predictable way. During the planet's transit events, RISE can very accurately measure the rise and fall in the amount of light reaching the Earth from the parent star - the camera can be used to pinpoint the time of the centre of the event to within 10 seconds. By observing and timing their transits, astronomers hope to detect small changes in the orbital periods of known hot Jupiters caused by the gravitational pull of other planets in the same system. In the right circumstances, even planets as small as the Earth could be found in this way. Gibson comments, "The potential of transit timing is the result of some very simple physics, where multi-planet systems will gravitationally kick one another around in their orbits - an effect often witnessed in our own Solar System. If Earth-mass planets are present in nearby orbits (which is predicted by current Hot-Jupiter formation theories) we will see their effect on the orbit of the larger transiting planets." "RISE will allow us to observe and time the transits of extrasolar planets very accurately, which gives us the sensitivity required to detect the effect of even small Earth-mass planets."